Description: The YF-12A (60-6935) carries the "coldwall" heat transfer pod on a pylon beneath the forward fuselage. The pod is seen with its insulating coating intact. In the background, the YF-12C flies photo chase. The coldwall project, supported by Langley Research Center, consisted of a stainless steel tube equipped with thermocouples and pressure-sensors. A special insulating coating covered the tube, which was chilled with liquid nitrogen. At Mach 3, the insulation could be pyrotechnically blown away from the tube, instantly exposing it to the thermal environment. The experiment caused many inflight difficulties, such as engine unstarts, but eventually researchers got a successful flight. The Flight Research Center's involvement with the YF-12A, an interceptor version of the Lockheed A-12, began in 1967. Ames Research Center was interested in using wind tunnel data that had been generated at Ames under extreme secrecy. Also, the Office of Advanced Research and Technology (OART) saw the YF-12A as a means to advance high-speed technology, which would help in designing the Supersonic Transport (SST). The Air Force needed technical assistance to get the latest reconnaissance version of the A-12 family, the SR-71A, fully operational. Eventually, the Air Force offered NASA the use of two YF-12A aircraft, 60-6935 and 60-6936. A joint NASA-USAF program was mapped out in June 1969. NASA and Air Force technicians spent three months readying 935 for flight. On 11 December 1969, the flight program got underway with a successful maiden flight piloted by Col. Joe Rogers and Maj. Gary Heidelbaugh of the SR-71/F-12 Test Force. During the program, the Air Force concentrated on military applications, and NASA pursued a loads research program. NASA studies included inflight heating, skin-friction cooling, "coldwall" research (a heat transfer experiment), flowfield studies, shaker vane research, and tests in support of the Space Shuttle landing program. Ultimately, 935 became the workhorse of the program, with 146 flights between 11 December 1969 and 7 November 1979. The second YF-12A, 936, made 62 flights. It was lost in a non-fatal crash on 24 June 1971. It was replaced by the so-called YF-12C (SR-71A 61-7951, modified with YF-12A inlets and engines and a bogus tail number 06937). The Lockheed A-12 family, known as the Blackbirds, were designed by Clarence "Kelly" Johnson. They were constructed mostly of titanium to withstand aerodynamic heating. Fueled by JP-7, the Blackbirds were capable of cruising at Mach 3.2 and attaining altitudes in excess of 80,000 feet. The first version, a CIA reconnaissance aircraft that first flew in April 1962 was called the A-12. An interceptor version was developed in 1963 under the designation YF-12A. A USAF reconnaissance variant, called the SR-71, was first flown in 1964. The A-12 and SR-71 designs included leading and trailing edges made of high-temperature fiberglass-asbestos laminates. 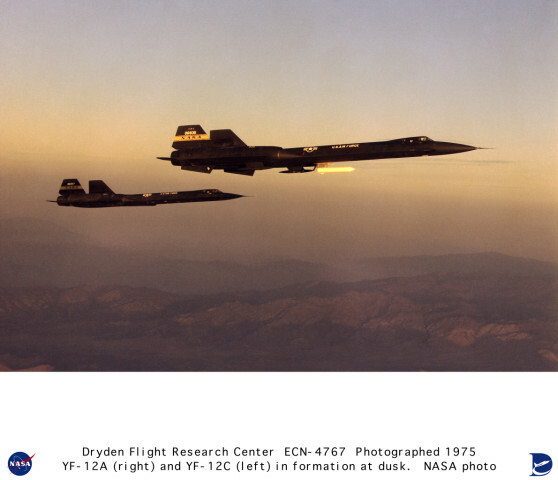 The NASA YF-12 research program was ambitious; the aircraft flew an average of once a week unless down for extended maintenance or modification. Program expenses averaged $3.1 million per year just to run the flight tests. NASA crews for the YF-12 included pilots Fitzhugh Fulton and Donald Mallick, and flight test engineers Victor Horton and Ray Young. Other NASA test pilots checked out in the YF-12A included John Manke, William Dana, Gary Krier, Einar Enevoldson, Tom McMurtry, Steve Ishmael, and Michael Swann. The YF-12C was only flown by Fulton, Mallick, Horton, and Ray.